Everyone has a different way, honestly. There is no rule or guidelines, other than laying it at an appropriate depth. I do know one thing... Unless you do it yourself, or hire a reputable company (Good landscaping is not reasonably priced, it will be outrageously expensive) then this is something that you will come to expect from most landscaping companies. There is a difference between a company that prides what they do, and one that needs to make money. As far as some of your issues on how far it backs up to something... You will never be able to prevent that, unless you have a barrier. Even if it weren't put so close, it will get pushed up against it during the first rain after. I recommend having bed liners, and barriers between any wooden surface and garden beds. Any wood contacting soil, or microbes will eventually rot. Without some sort of barrier it will be very difficult to keep soil off of wood. 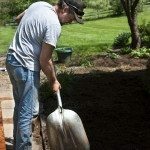 I would say that from here you will want to compare several companies, look at reviews, and expect to pay incredible amounts of money for good landscaping. It is quite difficult to find a good company these days, it would seem. Thanks for the opinion BushDoctor but I daresay, accepting poor work seems a poor alternative. There's a "right way" and a "wrong way" to every project and, taken separately, if you go to fencing they clearly warn against mulching up against a wooden fence and/or allowing debris (leaves etc.) to accumulate as it promotes rotting of the bottom of the fence. Foundation construction warns against mulching up against the foundation for reasons of drainage and it may attract termites and other insects; wood siding installers clearly don't recommend anything touching their product so... my point, even tho this is common sense, why isn't it part of "Mulching 0100" or part of the National Association of Mulchers (I'm sure there's one!) instruction set? As it is, we raked away over 3 garden carts of mulch, forming a 6" wide channel at the base of the wooden picket fence. This allowed access for painting. After that we spread a layer of pea gravel ($3.50 for a 40lb bag) and we're done. Of course we also located all of the covered pavers and swept them clean. Now then, if we pay college kids to spread our mulch, with just a little supervision, it all gets done quickly and without any issues. The fellow we're using is a recommended landscaping service (see Nextdoor.com) and we're paying him $700 a month [year round] to manage our 4 acre property. That's mowing 2.5 acres 27 times, mulching as needed (12 yds) and he's supposed to weed. The way things have been going I'm doubting the latter so have been vigorously spreading Preen in anticipation of having to do it myself. "Ya get what ya pay for" may apply to every category but even then, some fundamentals if not common sense should come into play. Lose to the service industry is the apparent notion that "Harry Homeowner" can't perform said service when in fact, "Harry" may just be too busy, lazy or just doesn't give a hoot. But properly motivated Harry can easily mow his own lawn, spread the mulch, weed and whatever else there is to do around the house. In fact, several on our street have gone back to mowing their own lawn simply because the "service" was tearing it up and thinking nothing of it. Status Quo is a poor standard or a window of opportunity for whoever wants to do it right the first time.